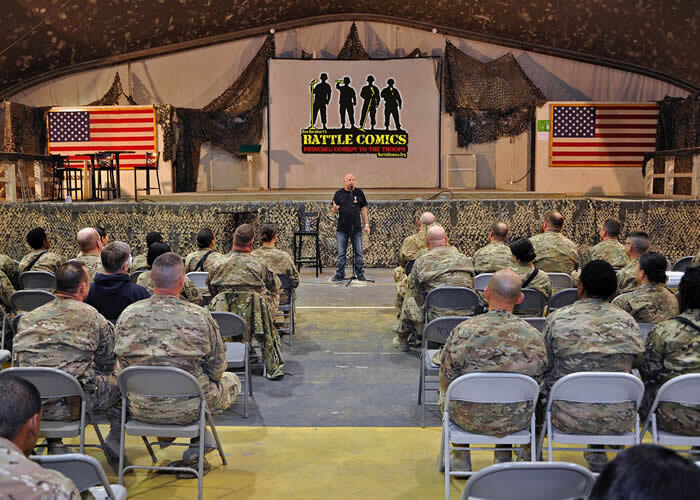 COMEDY FOR THE TROOPS - BATTLE COMICS . We proudly support entertaining the troops with our Batttle Comics! 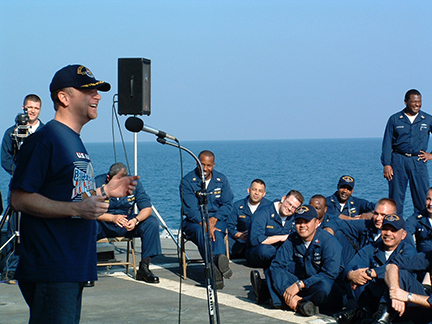 As our main charity, we have dedicated ourselves to providing comedy shows to the troops stationed overseas away from their families. Current statistics show that there are 22 suicides a day and we believe even one is far too many. Our goal is to boost the morale and welfare of the men and women serving their country by bringing them the highest caliber of professional comedians and entertainers in the most cost-effective way and you too can be a part of project. 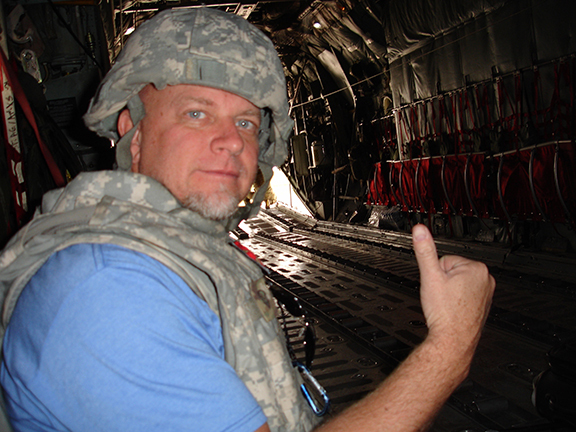 Your donations can help underwrite the cost of our comedy tours to the troops. Whether it's a small donation or you would like to sponsor a full tour, any amount will help keep the quality of the shows top-notch. Comedy shows can easily fit the largest venue to the most remote base with virtually no set up time. If there is a crowd, we can do a show! From ships to remote bases and the front lines, comedy shows have the benefit of little to no set up time. Don Barnhart Entertainment (DBE) provides autograph sheets, promotional posters and SWAG (promotional giveways; Tee Shirts, DVD's Posters, Patches, Coins, Etc.) 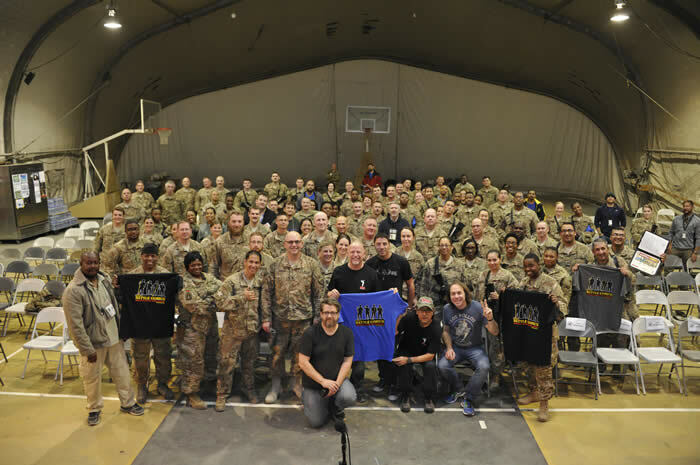 The entertainers truly enjoy spending time with the troops after the shows signing autographs and making friends. Depending on the venue, we can easily provide sound, lighting, backdrops and more. DBE uses only the top professional comedians working today. Each have recognizable credits or major club experience: The Tonight Show, Ferguson, Late Night, Comedy Central, HBO, A&E, America's Got Talent, Star Search, MTV, Showtime, NBC, BET, Last Comic Standing, Feature films, TV Shows and more. DBE currently books and consults for several comedy clubs and was the consultant for the hugely successful USO Comedy Break Series. Shows are easily adapted from Family Friendly to Cable TV but never nasty in nature and most comedians veteran performers and have done several tours and know the boundries and sensitivities of performing for the military. Corporate sponsorships are good business. By sponsoring a comedy tour, your company, product or brand will realize tangible marketing benefits in return for your sponsorship investment, while showing your support for the thousands of men and women in the United States Armed Forces. Along with the good will your company will create, you’ll be associated with your support of the troops and branded with the “All American” image with visibility and exposure throughout the worldwide military marketplace. EXPOSURE - Your brand or logo will be featured on show banners, tee shirts, autograph cards, promotional giveaways and more. The print and news media are constantly running stories on the life of soldiers and having your logo displayed in these feel good stories will help to increase your products trust and likability Many of the tours have been covered by CNN, Star & Strips, local media and the worldwide press. Immediately following the show, the performers sign autographs and take pictures with the troops. Many of the soldiers stay in contact with their family and friends back home through the internet and post these pictures on their Facebook, MySpace and Flicker accounts. Your product’s logo will be seen by the soldiers family and loved ones at home. We are looking to provide a series of two-week tours running each month all year long that will run both domestic and overseas reaching over 500,000 personnel at the 270 military installations around the globe. Comedy shows can be set up on flatbeds, in tents and make-shift stages, flying out to the ships on the flight deck, hangers, forward bases or huge events, theaters and extravaganzas. You’re company can say "thank you" for the sacrifices that the US military personnel make during their tour of duty. Don Barnhart Entertainment is proud to present the best American entertainers giving the troops a well-deserved break from the action. If you would like more information or a sponsorship package, please feel free to call or send us an email to the information on our contact page. Thank you for your consideration and support of our troops.